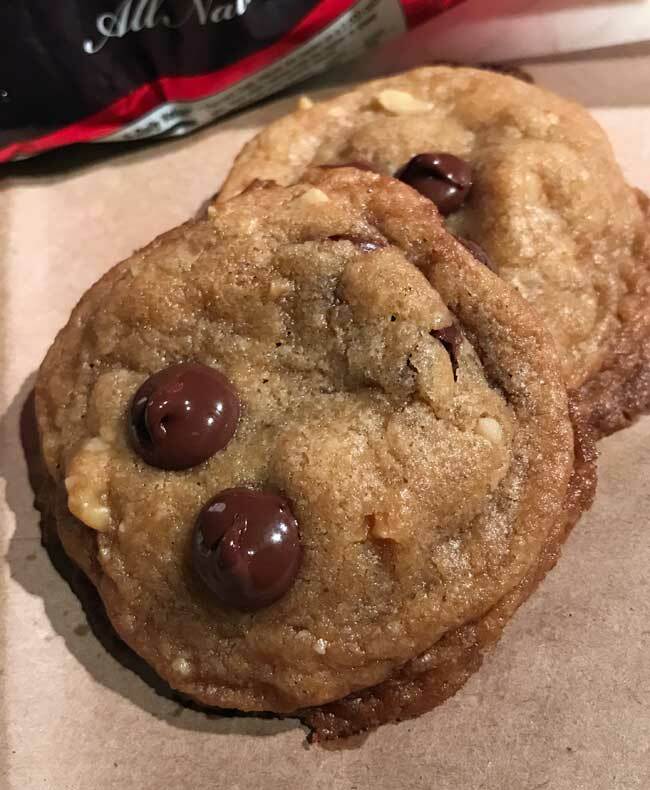 This recipe is one I put together after looking at quite a few different crispy chocolate chip cookie recipes. It has no eggs and does not involve any heavy beating, but rather gentle mixing with a spoon. The key to the crispiness is the lemon/baking soda mixture which fizzes up and makes the batter airy and light. The batter is shiny and buttery. It looks like the kind of batter that will bake into flat, pancake-like disaster cookies. Not so. Even un-chilled, the batter puffed up and spread out just right. I’ve baked these using freshly mixed dough as well as dough that had been shaped and chilled. Both room temperature and chilled dough worked well, so it seems you can bake these right away, or leave the dough in the refrigerator and bake them when you feel like it. In the oven, the cookies puff up high and then sink into wavy mounds. The edges will be very crispy right out of the oven. The centers remain sort of chewy for a while, but will crisp up over time. Crispy-Edged or Hard and Crunchy? Update: These are called Crispy-Edged cookies, but if you bake the cookies for 10 full minutes you may get cookies that are thin, hard and crunchy throughout. Depending on your mood and what you like in a cookie, that may or may not be desirable. 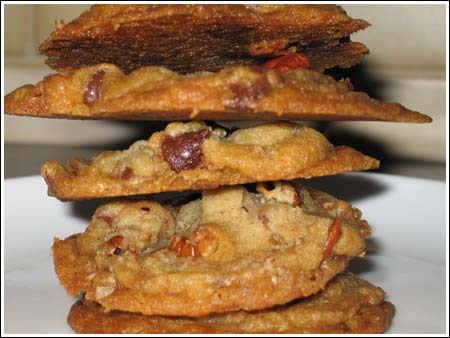 I love thin, hard and crunchy cookies so I make these often varying the nuts. The dough does start out pretty greasy looking, but go with the flow (literally, the butter is flowing out! ), mold into little rounds and bake. Also, pack with nuts. These should be thin, hard and crunchy. They’re really good frozen. Thin and crispy chocolate chip cookies made without eggs. Preheat the oven to 375 degrees F. Line two baking sheets with parchment paper or Silpats or just leave your pan ungreased and unlined if you prefer. Thoroughly stir together the flour and salt; set aside. Place butter in a microwave-safe mixing bowl and heat on high until melted. Stir both sugars into hot butter and let mixture sit for about 5 minutes so that sugar can dissolve a bit. Mixture will be shiny and buttery; stir in water and vanilla. Sprinkle baking soda over sugar mixture, but do not mix. Sprinkle lemon juice over baking soda and watch it fizz for half a second. Stir the fizzies into the batter to make a light, bubbly batter. Add flour/salt mixture mixture and stir until incorporated. Let dough cool completely if it is still warm (which it probably will be), then stir in chips and toasted pecans (if using). Drop by rounded teaspoonfuls onto lined baking sheets. Bake for 8-10 minutes. Mine took 10. The edges should be brown, the middles should be a bit paler. Caramel colored middles are okay too. Let cool for about 2 minutes on cookie sheet and then transfer to a rack of some sort to cool. Thanks for your comment. Keep practicing your cooking! By the time you are 16, you’ll be an ace. Hi Amy! Boy, it sounds like you’ve almost invented some sort of dark chocolate cookie. How do they taste? I’m sure they will freeze well. I just thought that maybe without the eggs, they’d keep well. They kept okay, but not as well as the Maple-Pecan chocolate chip cookies (the vegan ones). 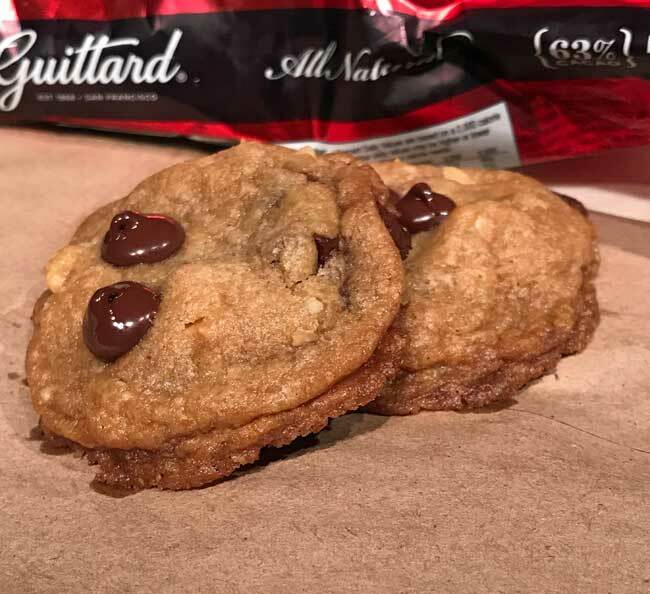 One more comment: it seems my butter was still pretty warm when the dry ingredients went in, so I have kind of a chocolate chocolate chip cookie. They’re also pretty dark because I used mostly dark brown sugar, as that’s what I had! I have these in the oven right now. Too bad they don’t last long– guess we’ll just have to eat them right up! Did you try freezing any? Just took a look at those All Recipes cookies. I’ll have to try them. I’d be interested to know what an all white sugar (no brown) chocolate chip cookie tastes like. Wow, I will try them out! I only like crisp cookies. I love this recipe for crisp cookies the best. Nice accent, tg. I hope you are using it on all your friends IRL today. Cyd, your B&B looks nice. I’ve never been to Montana. Interestingly enough, Todd and I once stayed at a B&B in Stowe Vermont where the Innkeeper’s wife was known for her chocolate chip cookies. They were the thin and crispy kind — similar to these, but not quite as good IMNSHO. Since the cookes don’t have any eggs, they keep longer, which is a good thing for a B&B. I may send a batch of these to Iraq. vot ees thees? a cookie vidout eggs? who efer HOID of such a think? !